“The Secret Life of Mrs. London” by Rebecca Rosenberg follows main character Charmian London, who is married to the famed author Jack London. In 1915 she goes with Jack to a magic show by the one and only Houdini, with whom she develops a deep connection. Charmian wants Jack to see her as an equal in both their marriage and as a writer, but this is something she knows Jack will never admit. Houdini, however, shows her that there is more to life beyond being Jack’s shadow. Over the next couple of years she will go through the ups and downs of life, experiencing love, joy, and tragedy, while learning the valuable lesson of what it means to live for yourself and your own desires. “The Secret Life of Mrs. London” was written with a captivating voice which made it difficult to force myself to put the book down. The pacing is comfortable and easy to follow, and Rosenberg’s characters are woven so intricately to become lifelike themselves. In itself, the book is a magic act comparable to those portrayed by Houdini’s character throughout the novel. This novel can be enjoyed by a general audience for anyone over the age of 16 or so. My favorite thing about the book was Charmian’s development. In the beginning of the book, she did as her husband wished being his support system and confidant. She had her own thoughts and desires, but she squashed them knowing that they would either be refuted or ignored as second to Jack’s. Over the course of the novel, however, Charmian seems to start understanding and accepting the fact that she does have her own desires, and that they differ from Jack’s. One thing Charmian was particularly critical of was her writing abilities, as she believed she would never be as good as THE Jack London. By the end of the novel, Charmian realizes that no, she is not Jack London, but she is Charmian Kitteridge London, and her writing and talents are her own to express how she sees fit. Her writing may be different than Jack’s but that did not mean that she was any less talented or important as a human being. Sometimes people come into our lives unexpectedly and it feels like a hurricane has blown through. These are people that make us question everything we thought we knew and experience emotions that have been pushed aside for too long. This is who Houdini was to Charmian. Through his passion and effervescence Houdini encouraged Charmian to live for the moment and appease her desires rather than push them down. Sometimes all we need is the help of another kindred soul to truly find our true selves. 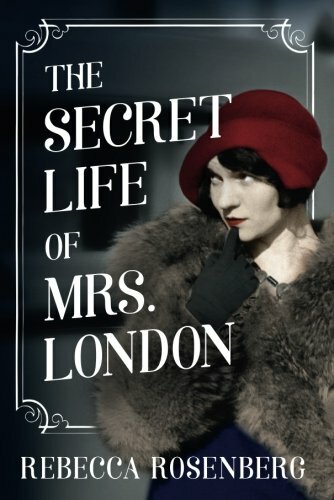 I highly recommend “The Secret Life of Mrs. London” by Rebecca Rosenberg.